The research will question how the use of personal narratives and online social platforms can contribute to transform dominant understanding on exil and migration in contemporary European societies. In a context of increasing situations of human displacement across the planet, the research aims to increase knowledge and empower cultural practitioners on this issue. 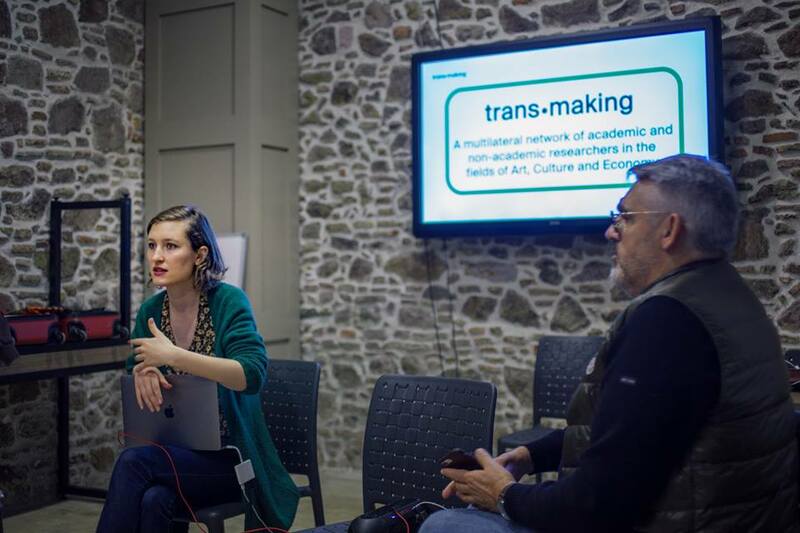 From 27 January to 2 February, a group of 20 international cultural practitioners have engaged in a workshop on displacement and asylum in Izmir. In this frame, the trans-making presentation has proposed to get to know the personal journey of a well-known Syrian author - Yassin al Haj Saleh - by mapping his itinerary from Syria to Turkey. This presentation has been supported by a selection of readings as well as the screening of the documentary film "Our Terrible Country", by Mohamad Ali Atassi & Ziad Homsi (Lebanon, Syria / 2014 / 85min / Bidayyat Production). "Our Terrible Country' takes us on the perilous journey of Yassin Haj Saleh, a well-known Syrian intellectual and dissident, and the young photographer Ziad Homsi who travel together in an arduous route from the liberated area of Douma/Damascus to Raqqa in northern Syria, only to find themselves eventually forced to leave their home country for a temporary exile in Turkey. The shooting of the film took more than a year in a number of regions in Syria and Turkey. The film, and the fate of its characters, represents the stages of the Syrian Revolution, from its pacifist beginnings to its militarization, the bombardment and destruction of cities by the Syrian Regime, and the emergence of extremist Islamist currents and their quest to take hold of the revolution." This screening was supported by Association L'Oeil lucide (France), with gratitude for Bidayyat for Audiovisual Arts (Lebanon, Syria).